Many composters are unaware that their composting activities in places such as schools, community gardens or on allotment sites operating a site wide composting scheme ( as distinct from plot-holders composting their own waste on their own plot for use on that plot) come under the waste regulations. This is the case even when the composting involves the same quantities and techniques as carried out at home without the need to comply with the Regulations. The Regulations were designed for commercial or large-scale operations but they apply to any 'undertaking or establishment'. This includes every organisation such as a school, charity, small food outlet or even a group of volunteers such as Master Composters. the type of material accepted for composting and the time the material is stored on site until it is ‘treated’, i.e. composted. This page will cover sites which will be Exempt but I am including the information on the Regulations so that the correct procedures are followed. Before searching further please befriend us on facebook and keep up to date on changes and additions to this site. Community composting covers a wide range of composting activities undertaken by groups and individuals who share a passion for making and using compost. Their activities may be based, in individual cases, on a general enjoyment in composting but normally there are a combination of environmental, social and educational objectives even if these are not specified, e.g. where the is an informal group on an allotment composting the waste produced on their and other plot holders plots to avoid bonfires on the site and organic waste going to landfill or incineration. Schemes that are with a more formal structure can also provide training, employment and volunteering opportunities. In addition, there are larger scale social enterprise schemes working with, and under contracts to, Local Authority providing kerbside collection services. Such schemes are outside the scope of this page but details can be obtained from the Community Composting Network (CCN) website. The CCN merged into the Federation of City Farms and Community Gardens at the start of in 2016 bringing to a close its 20 years as a standalone organisation working on behalf of over 700 community groups, individuals and other not-for-profit organisations that have made up its membership during that time. Composting groups running drop-off or bring to sites schemes for garden waste. A number of Community Composting Groups or Organisations collect waste, or have it delivered to them and providethe finished compost for use away from areas under their control. This obviously presents a degree of risk relating to the spread of disease if the raw material is contaminated with plant, animal or human pathogens. The Regulations are designed to help control the risks. Composting of garden waste produced on the site where the compost isto be used presents a lower degree of risk and this is recognised by the Regulations. While the composting of waste food, and including meat and fish, increases the risks involved these are still limited if the waste is restricted to food that was originally fit for human consumption (catering waste) and used on-site. Schools and Allotment Societies that only compost garden or fruit and vegetable waste produced on the site where the compostv is used can have greater control of the types and quality of the waste collected as well as control over its use. Under this conditions it should be possible to easily ensure that it will not be used where farm animals have access. In the case of allotments such schemes schemes have the advantage of being a local operation rather than one initiated in response to a suggestion by an external body such as a local council or other “waste” group. The National Allotment Society has members who can offer advice on such schemes. These schemes provide ownership and organisational commitment and sustainability. It also encourages more people to get involved in the running of their allotment site. My veiw is that where schemes are set up on an allotment the Allotment Society would be best advised to set up a separate Cummunity Interest Company to manage the scheme separate from the Allotment Society. The compost produced can be used to the benefit the CIC and any surplus could provide a source of income generation if sold to non-members. Normally a Community Composting site will require planning permission and the advice of the planning authority should be sort at the earliest possible stage. This will not be the case where a school has a few bins in their garden and is using them as part of the educational processes. It is also the case that an allotment scheme only consisting of a composing area for the use of the allotment plot-holders, does not result in a change of use, additional traffic or a potential nuisance. All that has happened is that most of the composting, which is a desireableand normal part of allotment gardening, is taking place at a central part of the site rather than on each individual plot. If there is the possibility of a composting service, being offered which would take waste produced by the local community planning permission will be required and there may be problems if the site is a statutory allotment and as a result can only legally be used as allotments for the growing of food for the plot-holders use. There may be a requirement not only for planning permission but also for the change of use to be agreed by the Secretary of State for any non-allotment waste processing activities. As a member of the National Allotment Society, I would not recommend surrendering part of a protected statutory site for the processing of community waste. If it is, a non-statutory council site or a private site part of which is unsuitable for cultivation an area could be set aside in the future for composting waste from the local community. However, the first priority on an allotment site must be encouraging and enabling people to grow food. The production and use of compost “on-site” also avoids the need to register under the Regulations relating to the carriage of waste. When considering the location of the composting area on the allotment site it is important to ensure that that it will not pollute the environment, disturb neighbours etc. and other protection designations (e.g. Nitrate vulnerable zones, source protection areas). Also when locating the composting area ensure that the noise from shredding or other activities will not disturb local residents due to proximity to inhabited buildings. The recovery and disposal of waste requires a permit under EU legislation with the principal objective of preventing harm to human health and the environment. This legislation also allows member states to provide for exemptions from the need for a permit, providing general rules are laid down for each type of exempt activity, and the operation is registered with the relevant registration authority. The UK has met the EU requirements through the Environmental Permitting (England and Wales) Regulations 2010 these require Community Composters to either register Environment Agency for an Exemption or for a Permit. The majority of Community Composting groups will be eligible for a T23 exemption (Aerobic composting and associated prior treatment). On some community, on sites such as our Compost Demonstration site additional exemptions are required to carry out related activities such as treating food waste in a wormery. All exempt projects need to register their exemption with the Environmental Agency. This is free and may be completed online. The on-line application is quick and simple if less than 10-ton waste is generated annually and used on site and no farm animal access or animal by products are composted e.g. just allotment waste. Larger processes will require more thought but the Registration processes is relatively simple. Projects, which do not meet the requirements of an Exemption, will need to obtain either a Standard Rules Permit or a Bespoke Permit. There are numerous charges associated with these permits. This Exemption is designed to allow the composting of small volumes of vegetation, cardboard and food waste to produce compost that can be spread to benefit the land by adding nutrients or improving the structure of the soil. community-composting groups where locally produced vegetable peelings and garden waste are brought to a central point for composting before it is returned to scheme members to be used in their gardens. The waste can be prepared for composting (Associated prior treatment by screening, chipping, shredding, cutting, pulverising or sorting waste for aerobic composting. Examples of the types and quantities of waste that can be treated under a T23 exemption are shown below. The list is not exhaustive please check the Regulations. These show the maximum quantities you can use and conditions for using the specific types of waste. Up to 80 tonnes of waste at any one time if composted and used the in the same place it was produced. The above waste can be stored for up to a month before composting. T24 - anaerobic digestion at premises used for agriculture and burning of resulting biogas. T25 - anaerobic digestion at premises not used for agriculture and burning of resulting biogas. U10 - spreading waste to benefit agricultural land. U11 - spreading waste on non-agricultural land. The Animal By-Products Regulations (ABPR) will apply if you are planning to compost catering or kitchen waste from premises handling meat or products of animal origin. Depending on the situation, additional approvals may be required and just to make life interesting these are not enforced by the Environmental Agency but by the Dept Environment, Food and Rural Affairs and Animal Health Agency. Guidance is available at https://www.gov.uk/using-animal-material-in-home-work-or-community-compost-heaps but to keep life simple I have included brief details here. The good news is that the regulations "do not apply to the composting of category 3 catering waste on the premises on which it originates provided that the decomposed material is only applied to land at those premises to which farm animals do not have access. i.e. So small-scale community compositing on allotments or in schools can include animal by-products (any material with animal content, including food cooked in animal fat or oil, or dairy products) that come from catering waste i.e. Leftover food and cooking oil from any kitchen or canteen including those in homes or offices, restaurants or caterers. However, commercial or industrial waste must not be composted. Farm animals including sheep, cattle, pigs, chickens and other poultry, including any kept as pets, must not have access to the compost or heap. No ruminant animals or pigs should be kept at the premises. If any poultry are on the premises the material, being composted must be kept in a secure container that prevents the poultry having access to it during decomposition. While approval is not needed to, use your compost on the school, allotment or other property where the composting takes place approval may be required if the compost is to be used at another location. Do you produce, or intend to produce, more than 10 tonnes of compost in a year? Do any farmed animals, including those kept as pets; have access to the area where the compost is made? Do farmed animals, including those kept as pets; have access to the place where the compost is used? How many people, apart from regulators and inspectors and customers picking up compost, have access to the area where the compost is made? A T26 Exemption is required for small-scale community composting of kitchen waste, including waste from the canteen, using a wormery. A small amount of paper and cardboard can be added to provide a drier fibrous element . The maximum that can be composted over a 12 month period is six tonnes. The resultant compost can be spread on land to add nutrients or to improve the structure of the soil. As with the T23 Composting Exemption farmed animals such as sheep, cattle, pigs or poultry, including any kept as pets, must be excluded from the area where the composting takes place and is used. Kitchen waste from premises which handles meat or products of animal origin are covered by the Animal By Product Regulations. As food waste treated in a wormery will not meet the temperature requirements of these Regulations , it may be possible only to use the compost on the site where where the food waste is produced and treated. If food waste is to be obtained from away from the site i.e. from another part of the school or college campus it is best to discuss the situation with your local Animal health Office. 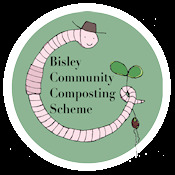 An excellent example of a community composting scheme on an allotment site is Bisley Community Composting Scheme. This is a is a members only scheme, located on the Bisley Chestergate Allotments to take garden waste, 'hot compost' it and return it as useable compost to members. The idea for community composting came from a meeting with allotment holders in 2004 and was developed by two committed allotments holders and the Allotment Warden. Village consultations supported by the Gloucestershire Wildlife Trust were held, and 35 households expressed interest and BCCS was launched in 2005. Stroud District Council provided a small ‘start-up’ grant. The scheme while based on the allotment is a separate Community Interest Company (CIC) with members paying a subscription of £25 a year. Volunteers manage the scheme, with help from some paid local labour. The scheme has approval for members to bring their garden waste to the composting site. Once composted, the product is offered back to its members, and can be used “off-site” Compost is also offered to allotment holders. It is possible to operate small community composting scheme e.g. on an allotment, community garden or at a school using a number of plastic compost bins but it is more usual for such schemes to contain their compost in wooden bays. These can be made larger than a conventional garden bin while still being of a size that can be turned manually. Larger schemes turning compost mechanically either use very solid bays, which can survive the occasional knock by the digger bucket, or Windrows. While windrows are very effective they will not keep a small site looking tidy, and well managed. If bays are, used three of four may be built joined in runs to enable the material to be turned from one bay to the next. The height of the bays will be determined by the method of turning. If the composting material is forked manually from bay to bay, they should be of a height at which it is easy to lift the material over the dividing wall. If a digger and bucket is used, which is reversed out of the first bay having picked up its load before being driving into the next the dividing walls could be higher. The minimum size for a wooden bay is one metre square but this can be increased to 10 x10 ft if mechanical turning is to be used. The bays should have removable front panels or be left open at the front for ease of access for wheelbarrows when to depositing the waste and for a digger bucket to turn the material or to move it to the next bay. Most community compost bins are made from wood. Including: scaffold boards, railway sleepers, pallets, fencing panels or pallets. Pallets can normally be obtained free of charge and can be lined with cardboard, plastic or carpet. In extreme circumstances, new timber can be used! Line these containers with carpet, cardboard or paper and have a very cheap bin. If waste is, only be accepted when the site is staffed this can be used saving time separating the waste. This of course means that even when the composting area is on an allotment to which access is restricted the site will need fencing. The designated drop of areas for stockpiling materials and sorting the waste into greens and brown materials, possibly sub-divided by ease of handing/composting, must be clearly indicated by signage. In the most community composting situations perennial weeds and annuals in seeds will not have to be separated out, as they will be killed by the heat produced in the composting process. However, members might prefer separation of perennial weeds etc to allow them to be drowned or dried out before commencing composting. Shredding woody waste will speed the composting process and is strongly recommended where hedge trimmings are composted.If possible material should be 1/2" to 1 1/2" in size. However, a shredder may not be needed for allotment or school garden waste which could be chopped up using a spade. Using a relatively small "domestic" machine to process large amounts of materials is extremely time consuming, noisy and not conducive to a pleasant working atmosphere. The local Council may provide a mobile shredder service, particularly if the school is maintained by the Council or the allotment is Council owned. Alternatively, the woody waste could be saved and contractors employed to use their own machine once or twice a year. For those sites with the room to do so long term heaps composed mainly of woody materials may be kept as a wild life refuges which will eventually rot. It should be remembered that woody material may be recycled as part of the gardening process with poles and sticks being used as pea and bean supports. If cooked food waste, particularly that containing animal by-products is to be undertaken it is best to use an in-vessel composting system where the composting process occurs in a closed composter such as a Jorra, Ridan or Rocket. Smaller quantities can be composted in a Hotbin or Green Johanna.Composting Food It may be necessary to add woodchip, sawdust or other carbon source to these composters. The use of such bulking materials as alternatives to other carbon sources such a straw or cardboard, is that they can be easily measured enabling consistent quantities to be added to ensure the correct Greens: Browns balance. Depending on quantities and the type of composter used garden and uncooked vegetable waste from the kitchen may be added or composted separately in traditional open systems. Progress of temperature and moisture levels (if monitored) can be plotted on a graph to show progress of each batch. In order to be sure the compost is 'sanitised,' meaning that every part of it has heated up sufficiently to kill potential pathogens and weed seeds, the heaps should be aerated by turning at least twice. The temperature of the compost in the heap should be monitored as the temperature provides an accurate indicator of the decomposition process and how well the system is working. Monitoring and recording the temperature can form an interesting science project for schools and forms an important part of quality control. The compost should initially heat up to at least 40C or 50C while temperatures in excess of 65C may be achieved with some rapid methods that can reach 70C+. The regular turning this temperature can be held for up to 15 days. If the heap fails to heat up it is likely that the green: brown mixture or moisture content is not correct. Temperature readings can be taken using a using a probe type soil thermometer that reaches deep into the compost. A 'Lockable' thermometer allows the temperature to be taken in the middle of the heap and 'locked' before the instrument is removed. I understand that some composters use a cheap radio controlled weather station transmitter, placed in a polythene bag, buried in the centre of the heap to transmit to the core temperature to a receiver in the shed. Take readings at different locations and depths. If the bin has a removable boards separate them sufficiently to insert the thermometer between the boards and take readings at different levels from the top and sides. Expect to find that the heap will contain hotter and cooler pockets and the location of these will vary with the design of the bin. To enable comparison always take the readings in the same places. The temperature at any point within the bin will vary depending on activity of the microorganisms in that area, this will depend on the mixture, stage of decomposition and the heat loss as a result of surface cooling and aeration. A well-insulated bin, such as the Hotbin , or a wooden bin with added insulation (see Winter composting) will reduce heat loss. The temperature is also dependant on the moisture content with compost mixtures that are dry (higher carbon) heating up and cooling down again more quickly than wet material. Moisture levels can also be recorded using a moisture meter, available from horticultural suppliers and garden centres, 50% is the recommended moisture level..
Moisture can be checked when the compost is turned by taking a handful of compost and squeezing. If two or three drops of water are produced moisture content is ideal. Any more the release of more water indicates that the compost is too wet, any less it is too dry. To maintain a temperature sufficient to sanities the material (55-70C for 10-15 days) and produce compost quickly it is necessary to aerate the material by turning when the temperature starts to fall below 55C, or if reaches over 72C when is so hot that it may kill the composting microorganisms. Ideally the temperatures should be recorded daily and at the same time each day. Using temperature as the means of determining when to turn is more efficient that turning at fixed intervals and means that temperature records are kept Turning is made easier if a three or four bin system is used allowing the material to be moved along the row each time it is turned. As mention elsewhere, the material on the outside of the bin should form the centre of the new pile. This ensures that all of the material will reach optimum temperatures during the composting process. .
A hand operated sieve suitable for an allotment or school site can be made or bought relatively cheaply. Small powered screens are available, Heeley City Farm in Sheffield bought one second-hand for £2,000 some time ago. 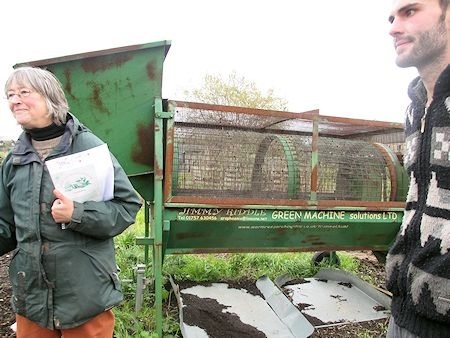 Second hand machines designed for other uses can be adapted to be a compost sieve. The Seagull project in Skegness use old sand and gravel grading machine, while the Lympstone & the Shaw Trust have adapted old potato riddles. Sending samples of the finished compost for analysis is expensive but you can easily run your own trials. These can also provide an additional school projects. Fill a seed tray with finished compost and see if any weeds germinate. A comparison can be made between compost produced by “hot” and “cold” composting methods. Plant some plug-plants in the compost and plant contrails in ordinary soil and shop brought compost. Compare how they grow taking photos at key stages. Sow seeds in it and see how well they perform when compared with shop brought compost.